Detects LH (Luteinizing Hormone) which is in the urine of women. LH increases dramatically in the middle of the menstrual cycle. Turn the lens holder while holding down (lamp is on) the push button to adjust the focus. INVALID: No visible image appears. Repeat test. The One Step ovulation test will help you find the time when you are most able to become pregnant and help you plan your pregnancy. Luteinizing hormone (LH) is always present in human urine. It increases just before a woman's most fertile day of the month. This LH increase triggers ovulation. During ovulation an egg is released from the ovary. Because the egg can be fertilized only 12 to 36 hours after ovulation, detecting ovulation in advance is very important. You may do this test at any time of the day, but you should test at approximately the same time each day and reduce your liquid intake for 2 hours before testing. To decide when to begin testing, determine the length of your normal menstrual cycle. The length of your cycle is from the beginning of one period to the beginning of the next (count the first day of bleeding or spotting as day 1). If your cycle length is irregular, that is, if it varies by more than a few days each month, take the average number of days for the last 3 months. The length of the menstrual cycle is the duration from your first menstrual bleeding day to the day before the next bleeding begins. Determine the length of menstrual cycle before you test. lf your cycle is shorter than 21 days or longer than 38 days, consult a physician. lf you do not know your cycle length, you may begin the test 11 days after your first period since the average cycle length is 28 days. Perform 1 test each day over a 5 days period, or until the LH surge has been detected. 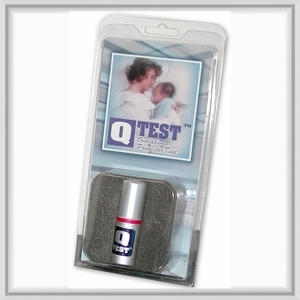 * If your QTEST™ Ovulation Predictor device fails to work within 1 year from the date of shipping, we will repair or replace it at no cost to you (cost of shipping is not included).